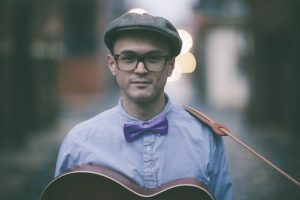 New York City’s Seiichi Daimo possesses a folk vibe reminiscent of The Lumineers and the pop-driven hooks of Ed Sheeran and Phillip Philips, which he shows of on his debut EP, In The Inbetween. Identifying his music as indie folk/contemporary blues, written in a pop mindset, he brings a refreshing, genuine intention with his music, aiming to create and share meaningful, melodic music to inspire those around him. Ghettoblaster recently caught up with him to chat about the EP, which hits streets in late-Februrary. This is what he told us. When did you begin writing the material for your In The Inbetween EP? I began writing the material for the EP a little over a year ago. Definitely the title track “In The Inbetween”. It’s a pretty weird song. It has a catchy hook and an uplifting message but it also has a ton of time changes and feel changes. We knew we wanted to make a dancy pop song but wanted to go about it in a very different way. We wanted to explore how far we could take it without it feeling strange to the casual listener. It took some trial and error especially on percussion, but I think we came out with something pretty cool. I would have to say “In The Inbetween” again. This song changed so much and went thru so many versions of lyrics. I knew that I had an opportunity to do something new and different with this song so I really explored where it could go. The chorus was actually written after I thought I had completed the song. Then one day when I was driving in my car it hit me. Causing me to rewrite the lyrics again of course. Ha ha. I did. I am very lucky to have some super talented friends. My buddy Joseph Stasio played most of the accompaniment (banjo, drums, synth). Joe’s brother Marc Stasio played some bass for us. Along with Taylor Mandel of the band The Ugly Club on keys and trumpet and some electronic vocal processing on the song “Wishing Well” by my bud Keenan Gaynor of the band Declan’s Well. I like involving friends on projects. Definitely makes tracking more fun! The record was produced by Joseph Stasio of beardedaxe.net. Joe is an accomplished jazz guitar player and has produced some great records. Joe has a very original style and I thought the combination would work very well. We think very similarly while at the same time his jazz structure complimented my free form writing. We were able to push and be creative without trying to fit into a certain box. Is there an overarching concept behind your new EP that ties the record together? Yes, I actually had the concept before I began writing. I was at a point in my life where I was feeling a little stuck. Just frustrated. I felt like I had been working so hard for so long but still had a long way to go before being where I wanted to be in my life. “In The Inbetween” is about being in a state of transition or transformation. I realized the concept was widely adaptable. We are all in some form of transition. Things are always changing and time is always moving forward. The concept took on a larger meaning. It became the cycle of the whole spectrum of living, past, present, and future. I have. Playing live is great! It’s a connection to the listener that you cannot get any other way. Seeing people’s reaction to a song that they connect to on the first listen face to face. I’m happy that people get enjoyment out of what I do. The song that I think gets the most reaction live is the song “Moon”. It’s a love story that transports you. I wanted to write the lyrics in a way that you can’t help but have flash backs to your own personal experiences. That’s the magic of music!